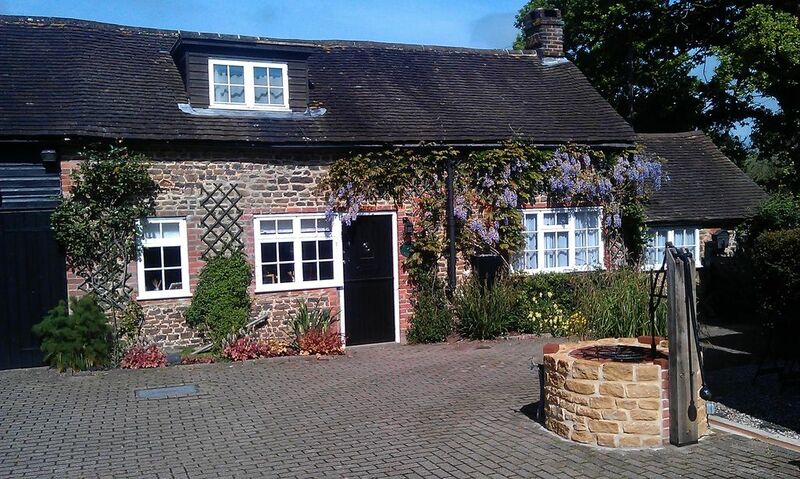 Greenhurst Cottage is a recently refurbished two bedroom Grade II listed property full of character, providing comfortable self catering accommodation. Located between the villages of Thakeham and Storrington in West Sussex, it is an ideal base for exploring the South Downs, or the nearby visitor attractions. We welcome walkers and cyclists as well as those that just want somewhere peaceful to relax. We couldn't believe our luck when we finally moved into Greenhurst early in 2013. The house and cottage had been empty for several years, and we spent our first year working to restore the cottage to its former glory. As a family, we have spent the past ten years staying in various holiday cottages around Britain, and have been very lucky with the places we have stayed. We have been determined to present the cottage to a standard that we would be delighted to stay in ourselves. We fell in love with this area of Sussex 15 years ago, when we moved here from Kent. The house and cottage came as a package, and were irresistible, packed with character and charm. The location is a ideal for us, offering the peace and quiet we wanted from a rural location, but with all the amenities we need to make life easy nearby. With beautiful surrounding countryside providing a peaceful retreat, we enjoy walking over the nearby fields to the pub for Sunday lunch, or cycling up the Downs. The garden was previously opened to the public by the previous owners, and contains a wide variety of unusual plants that keep us busy through the year (though to be honest, mum's been here most weekends working on the garden for us!). The bathroom is on the ground floor, and contains a wc, sink and shower. The sitting room has several charming period features, and reminders of the building's former agricultural use. Visitors are welcome to make use of the log burning stove, TV (with FreeSat) and DVD player. The kitchen includes an oven, hob, fridge-freezer, microwave and washing machine, as well as a dining table. Outside: The cottage is set within the grounds of the owners property, and guests are welcome to make use of the shared 1/2 acre garden. The cottage has its own barbecue and access to a shared clothes line. The garden does contain a large pond, so parents will need to supervise toddlers at all times. Cleaning / Towels / Linen / Maid service: Towels and bed lined are included, and a washing machine, iron and ironing board are available should you wish to use them. The property is cleaned regularly and kept to a high standard. Property was exactly as described and the cake provided a warm welcome! A great base for driving and taking long over the South Downs. Great for a long weekend away or more. Thank you for your kind review Niall. We're so glad you enjoyed your stay with us. Hopefully we can welcome you again some time. A great place to stay and explore the South Downs. We booked this at short notice and we were not disappointed. The cottage is cosy and well equipped . The lovely garden proved a big hit with our two grandsons were they could play and use the tree house. We had our bicycles with us and found the Downs link a safe, flat and scenic route. The owners, Matthew and Caroline, were very welcoming and keen to help us enjoy our stay. They even allowed us to wash the mud off our bikes (yes it did rain) and store them in a lockable shed. In short a great base to stay for cycling, walking or day trips . Thank you Matthew and Caroline. Thank you ever so much for your kind comments. It was lovely to meet you all. We're glad you enjoyed staying with us and hopefully we can welcome you again in the future. I would definitely recommend this cottage near Storrington. We went there for a short weekend and we will come back for sure. The house is amazing, cozy with a big garden, where we had BBQ. There are many places around that you can explore either driving or walking in the foot paths. Caroline and her family were great hosts. They were very kind and they helped us with everything! We enjoyed our stay very much. Thank you Stella for your kind comments. It was lovely meeting you too. Hope we can welcome you to Greenhurst again in the future. We had a great weekend at Greenhurst cottage. We stayed two nights on our way to the New Forest near Southampton. Very clean and equipped with all the necessary appliances. Comfortable beds and a nice kitchen. Beautiful garden where the kids can also play if wanted. Very good area for walking and outdoor activities. Shops nearby. The homemade cake on arrival was a great treat after a long trip from Holland. Travellers from Europe: don't forget your conversion power plugs because your battery charger will not fit in the standard UK sockets. Plugs can be obtained at Sainsbury's for 2 pounds each. We (2 couples, parents and married daughter) stayed at greenhurst for just under a week to visit family in the area and attend a family wedding. We were so delighted to have found Greenhurst, it was very relaxing (we hadn't expected to feel relaxed on this trip), peaceful and charming. The garden is magnificent and on a sunny day the perfect place to have a cuppa. The owners were very welcoming and helpful. Fresh cake on our arrival (which by the way was one of the best Victoria Sponges we've ever had) and fresh flowers were very nice touches. Beds were very comfortable and there was plenty of space to hang clothes and leave suitcases. Highly recommended cottage to explore the local countryside or to just get away and chill out! WiFi was speedy, and everything worked well. I'm sure we will look to book again the next time we visit! Thank you! Thank you for your review Gabby. It was lovely to meet you and your family and we are glad you enjoyed your stay. We look forward to welcoming you to Greenhurst again in the future. We had a lovely time staying in Greenhurst Cottage this April. The cottage itself is very cute, it appears to be quite small but in fact there was plenty of space for 4 of us (2 adults and 2 teenagers aged 16 and 14). It had a very well equipt kitchen and there was loads of room for our belongings in the bedrooms. The whole place was beautifully clean and I must say that the beds were really comfortable! The setting was in a peaceful location, surrounded by green fields and I was told there were plenty of walks if you so wanted. The location was brilliant for us as we wanted to visit Brighton and Arundel Castle, which were only a short drive away. The Owners lived directly opposite, and they were a great family, very helpful without being intrusive and Caroline had even baked us a cake on our arrival. We would definitely re-visit this cottage and recommend it to our family and friends. Thank you for your kind review. We enjoyed meeting you and hope we can welcome you to Greenhurst Cottage again. Worthing is the nearest beach, just 9 miles from the cottage, with various other beaches nearby on the south coast. The closest sandy beach is 22 miles away at West Wittering. We are in a rural location, so use of a car is essential. Our nearest airport is London Gatwick (40 minute drive), with the port of Portsmouth 1 hour away, and Folkstone / channel tunnel a 2 hour drive. We are situated just outside of the South Downs National Park, which provides some great opportunities to explore by car, bike or foot. There are several good pubs serving food within a mile, and details of some suggested pub walks across the surrounding countryside are available in the cottage. There are many interesting places to walk within a short drive of us, including the Chanctonbury Ring, the old Roman fort at Cissbury Ring, the South Downs and the characterful nearby villages of Steyning and Bramber. As keen cyclists ourselves, you are welcome to use the cottage as a base for exploring the South Downs by bike, or cycling the family friendly Downs Link. We can provide storage for bicycles, bike washing facilities and various tools if you need them. There is a washing machine in the cottage, which can be useful for getting your kit cleaned at the end of an adventure. Booking Notes: Please contact owner. Changeover Day: We are flexible with start dates. The cottage will be available from 1500 on arrival, and we ask guests to depart by 1030 on their final day. Notes on prices: Stays of two or more nights are available. A deposit of 50% is required at the time of booking, with the balance due 28 days before the start date of your stay.